Lagos and Abuja — In a solemn end to a General Court Martial in Nigeria, the military has sentenced 54 soldiers of the Nigerian Army to death. They were found guilty of mutiny – refusal to fight Boko Haram – in Borno State. Reporting contributed by Davidson Iriekpen and Senator Iroegbu. Five other soldiers were discharged and acquitted. The 54 soldiers were among the 97 military personnel, including 15 officers, whose trials were announced on October 15, for various offences. The final judgment lasted some two hours and the announcement was made after 8 pm on Wednesday December 18, 2014. The details were not clear since journalists were barred from the proceedings. However, a military source confirmed today that 54 of the 97 soldiers were sentenced to death, which is the statutory punishment for their offences, while five others were discharged and acquitted. 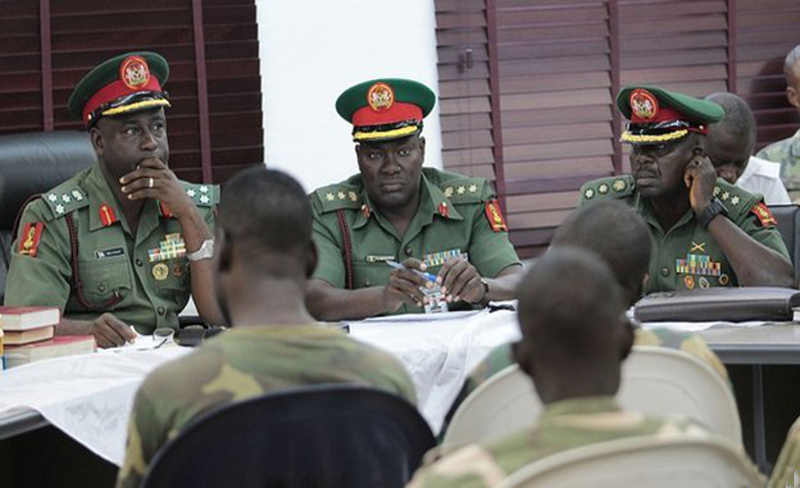 The court martial presided over by Brig-Gen Musa Yusuf at the army headquarters, Garrison, Abuja was initially open to the public until journalists were stopped from covering the proceedings. Mr. Yusuf argued that journalists may not only jeopardize the operational details of the ongoing war on Boko Haram but also the counter-insurgency operations in the North-east of Nigeria. Yusuf had slapped Corporal Andrew Ogwulekwu and 59 others with two counts of charges including: criminal conspiracy to commit mutiny, and count two, refusal to carry out an order to face Boko Haram insurgents. According to the charge sheet, the soldiers on trial had refused the orders of their commanding officer to advance on an operation to recapture Delwa, Bulabulin and Damboa in Borno State from Boko Haram terrorists. The condemned soldiers are to die by firing squad. Human rights lawyer, Mr. Femi Falana (SAN), has described the conviction of the soldiers as the height of injustice, adding that their conviction was an act of genocide that should not be allowed to stand. “This is the height of injustice because there was no evidence linking the boys with mutiny. Apart from the fact that there were no weapons for the soldiers to fight, they fought gallantly because the prosecution said after the boys protested against the fact that they did not have weapons to fight, they went back to fight and they fought gallantly. “Don’t forget that even President Goodluck Jonathan acknowledged that there were no weapons for the soldiers to fight when he asked the National Assembly to approve $1 billion to buy weapons for the military to tackle the insurgency. So on what basis were the soldiers convicted? “This is an act of genocide that we should not allow to stand. We shall report Nigeria to the International Criminal Court (ICC),” he said. The announcement of the death sentences of the 54 men has become what many young people in Nigeria and around the continent believe are long entrenched injustices of Nigerian elders. “This reeks of corruption at the highest level. But not only that, it speaks to a wider issue, in fact a problem, in this country. How some people, some elders of Nigerian society, Army Officers and people in political office continue to show a total disregard for the human and civil rights of their own people continues to baffle me. “When you ask soldiers to go out there and fight others without the tools, the weapons, they need to execute their duties, then you are sending them into battle to just die without giving them a chance to defend themselves. That is genocide in the strictest definition of the word,” Mr Obogin Matowo, a journalist at one of Borno State newsletters retorted. Many young activists in Nigeria and Ghana continue to call for the release of the 97 soldiers or at the most, a lessening of their charges. They hope to bring attention to the case and implore the international community to use pressure to force the hand of the Nigerian Military and the Nigerian government to do the right thing. Taking Nigerian soldiers to the firing squad to be shot like dogs would remain a breach of trust between government and the people of Nigeria. 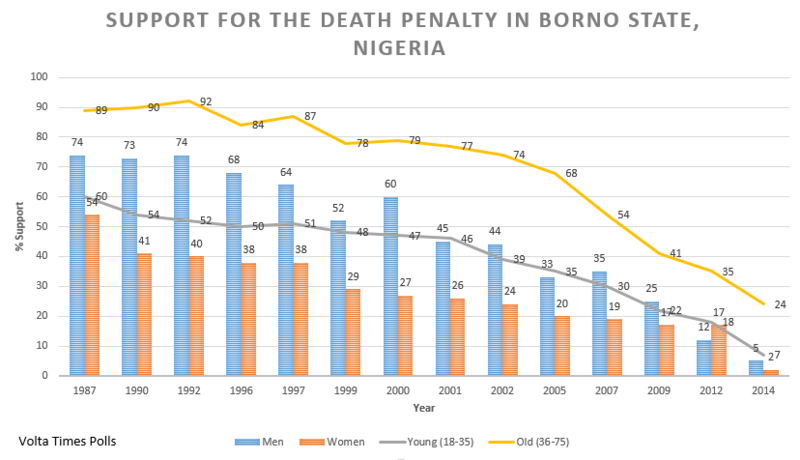 In fact, polls since 1987 conducted by the Volta Times found that less than 10 percent of Nigerians, especially in Borno, support the death penalty in general let alone one that is marred by the inconsistencies of the Nigerian government. These polls point to a widening gap between government officials in Nigeria and Borno, and the people who live and work in Borno State. Hopefully the ECOWAS community, the African Union and the international community can bring pressure to bear on the Nigerian Military to desist from carrying out what would otherwise be genocide. This should never happen in Nigeria or in any part of the world. The Nigerians pulled a Stalin move: don’t turn back from war or I will kill you myself. Though I am sure history will show that Stalin learned this from Africans, as all courage is out of Africa. You call killing courage? These soldiers did not have adequate weapons to fight. You cannot send people to battle without weapons. This ruling should be reversed immediately. I disagree that the International Criminal Court should have anything to do with this fiasco. We all know that the ICC is really just a place for the world to criminalize Africans and that no other nation will report their law breakers to the court. Nigerians should handle this case and if they feel necessary bring it to West Africans or an independent African body to review.